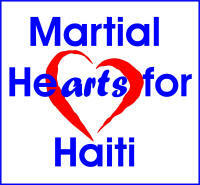 Join us on February 20th as we work together to raise funds for the victims of the terrible tragedy in Haiti. 100% of all funds raised will go to CARE. This is one of the events of our Chinese New Year Celebration. We have lots going on during the two-week celebration of the Lunar New Year. 5:30 pm: Kick-a-thon. Participants will do 1,000 kicks to raise money from sponsors. We've invited different schools from around the area to participate. Which school will raise the most money or have the most participants? We'll do the kicks in four blocks of 250 with demonstrations of kung fu in between. 6:00 pm: Caribbean-theme food and refreshments. We'll have lots of good food. You're invited to bring a favorite dish to share even if it isn't Caribbean food. There will be some overlap with the kick-a-thon and demonstrations as we transition from kicking to eating. 7:00 pm: Dance party. We'll have music provided by DJs Sean Marshall and Jose Vega. There may be break-dance battles, lots of great music and dancing. We'll have special lighting to give Jing Ying the warehouse rave feel. To raise money for Haitian relief, we are asking for a donation of $10 per person or raising $100 or more in sponsorship for the kick-a-thon. Volunteers are needed for the set up and running of the event. Can't make it to the party but still want to help? You can make a direct donation. Drop off your donations at Jing Ying or make a payment on-line right now!